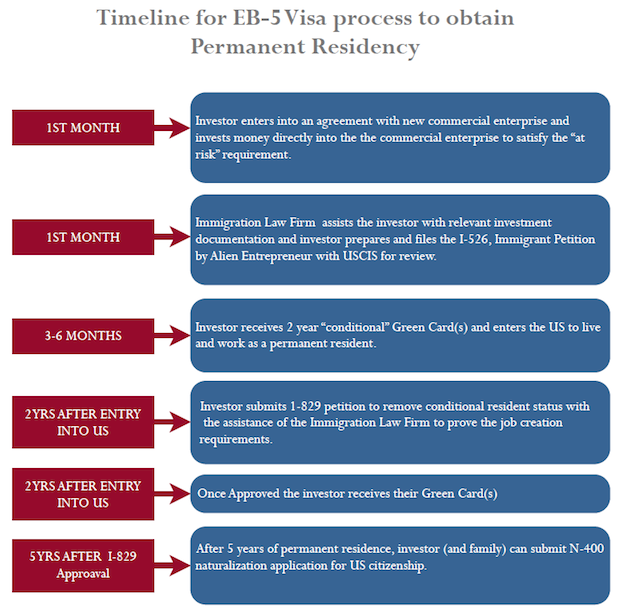 How long does the EB-5 Process take? The most frequently asked question we get from prospective investors is “How soon after I apply for the EB-5 visa can I enter the United States?” Adding up all the months on the lower end, you can expect to be able to enter the country in approximately one year, but it often takes longer. 1. Selecting the right EB5 Direct Investment or EB5 Regional Center project (1 to 3 months): choosing the right project can take longer than you expect. In addition to the time it takes to learn about the process enough to be comfortable about investing, potential investors also might have to wait until a prospective project they learned about through pre-launch information opens and accepts subscribers. 4. Consulate interview or Adjustment of Status Form I-485 filing (4 to 9 months): This timing depends on where you are and how backlogged the USCIS is – this is why you will see many different websites showing different numbers for this part. After this stage you can enter the United States on your conditional greencard which is valid for two years. 5. Filing for Removal of Conditions Form I-829: this filing is done during the period between the 21st and 24th month after receiving your conditional greencard. This process takes approximately 6 to 9 months. 6. Five years after receiving your conditional greencard you can apply for U.S. citizenship.